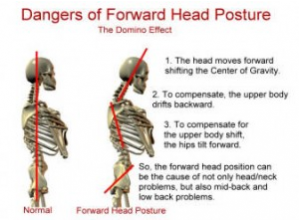 FORWARD HEAD POSTURE may not seem like a big deal now, but over time it will create many body issues…joint problems, poor balance, headaches, digestive problems, breathing problems and more. FOUNDATION TRAINING will retrain the weak and out of position musculature. Start today…FT is easy to learn and can be done anytime…anyplace. Most people to not hinge at the hips in order to bend over, sit or performe other everyday movements. The ability to hinge and the hips activates the glutei and hamstrings muscles. The muscles groups become weak from sitting to much, lack of movement and improper movement patterns. Therefore, the low back usually flexes way to much causing pain and injury. Notice I said, “causes”! When we can fix the cause of something…we get better. Human bodies are meant to move and need to move! Knowing how to move better…decreases pain and injury. So, start moving more!!! Steveygaddis.com…call for FT session. See how you move…learn how to move better! Do you suffer from chronic or occasional back pain? Do you have a herniated disc or back spasms? Aching knees, sciatica, or hip pain? Are you starting to bend over a little as you walk? Are you looking to improve your quality of movement? Want to feel stronger and healthier? Not ready to think about surgery? If you answered yes to any of the questions above then Foundation Training is absolutely for you! There is no reason to wait any longer for relief. You must learn Foundation Training…it works! The best medicine for the body is movement! All the ailments listed above can be helped thru a daily routine of Foundation Training. I know this because I practice FT daily and have had chronic back pain for over 30 years. I have low back degeneration, a bulging disc and S I joint rotation. I get tight back muscles from sitting at my desk, from rotation in the pelvis when I play golf. I have been in the fitness industry many years… I have played many sports, exercised, lifted weights, stretched, iced, soaked… I have seen it all and done it all. The first time I tried Foundation Training…I knew it was different! My body felt it. Couldn’t explain why something so simple to do…helped so much? Why didn’t I already know about this? My mind raced with anticipation of how FT could help so many people. Here I am two years later. I feel great! I can keep my back problems in check by doing a little FT each day, a monthly chiropractic adjustment and my massage. I am as active as ever… Movement is the best medicine for the body! I have taught a lot of FT and have helped a lot of people learn about their body and how to take better care of it. I wish I could help more people. Doctors need to know about Foundation Training! Doctors need to prescribe Foundation Training instead of muscle relaxers. Decompression Breathing is a muscle relaxer! Creating length in the posterior chain coupled with decompression breathing…is a better stretching method and helps muscle imbalance verses a single leg hamstring stretch. Doctors, therapist, coaches, athletes…lets get new school.